Crock Pot Taco Soup - Recipes That Crock! Do you love a good Crock Pot Taco Soup? We sure do! This recipe for taco soup is one of our favorites! Here in Indiana we are SO OVER this cold weather. Today sweet old Mother Nature dumped another 5 inches on us… or so I hear. Truth be told, I am boycotting the outside until it shapes up out there! Today was a perfect day for cozy blankets, warm fires, Netflix and THIS soup. We found the original recipe for this soup in Slow Cooking All Year ‘Round. I did tweak it just a bit. We added some taco seasoning and I substituted one can of black beans for white chili beans. The result is a hearty Crock Pot Taco Soup that is perfect for a crowd or an easy weeknight dinner. We’ve even spooned it over a bed of lettuce to make a yummy taco salad from time to time! 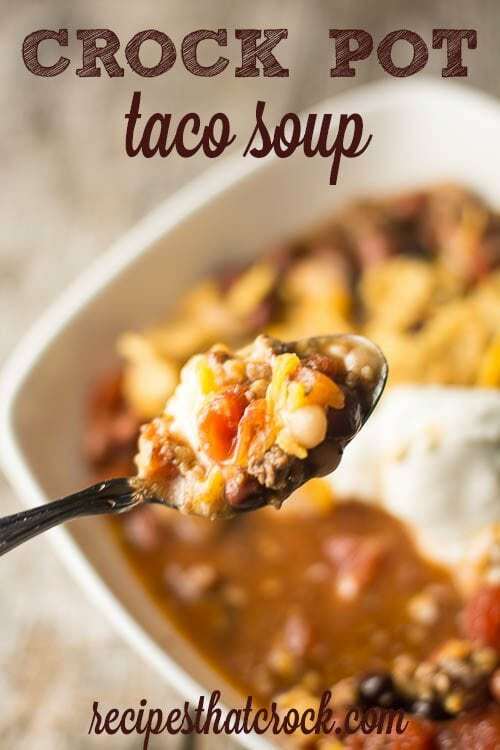 Super easy and delicious Crock Pot Taco Soup altered from Gooseberry Patch's Slow Cooking All Year Round. Garnish: shredded cheese crushed corn chips, sour cream, etc. Brown sausage and ground beef with onion, sprinkling with taco seasoning while cooking. Drain and transfer to slow cooker with remaining ingredients (except garnish). Mix well, cover and cook on low for 4 -6 hours. Serve warm with desired garnishes. Since this recipe has a browning step, we love to use one of our stove top slow cooker models to brown the sausage in our crock and then transfer to the cooking unit– keeping it a true, one-pot dish. We also love our automatic stirring crock pot for most of our soups because it keeps those flavors all stirred up during cooking. However, any 5 to 6 qt slow cooker should work just fine for this recipe. Love Taco Soup!! Pinning to try! !